Hello 2019! We are going to ease into the year with a sweet, lightweight stitch. I hope you like it! Today's stitch comes from a blue and cream striped and more pillow. (The stitch for the blue stripes was featured last year.) I added the blue accent to the cream stripe to augment the adjacent blue stripes. The stitched sample uses Elegance (dark gray lines), Petite Silk Lame (aqua lines), and Sundance Beads with clear beading thread. This stitch would make a gorgeous roof or floor. I love the filled centers. You could do them all in the same direction. However, I am drawn to the interest the different directions add. If a bead isn’t your style, consider adding your favorite 2X2 stitch in the center of the open square. This link offers several other 2X2 ideas. A lightweight thread combinations for a floor include DMC Perle Cotton (gray lines), Bella Lusso Wool (aqua lines), and a matte finish seed bead. I would use Glisten (gray lines), Vineyard Silk (aqua lines), and an Upright Cross for the center of the squares in Flair for a roof. I’m wrapping up 2018 with a trifecta! It’s a favorite stitch in my favorite color from one of my favorite holiday pillows. While today’s stitched sample focuses on a monochromatic example with Elegance and Flair, the original post elaborates on several different variations of thread and color combos that can help bring your areas to life. I encourage you to revisit the original post. It has some cute ideas to spice up this stitch. Today's stitch is one of my favorite cheats. It's pretty but also goes really, really quickly. Truthfully, most diamond stitches are fast stitches. 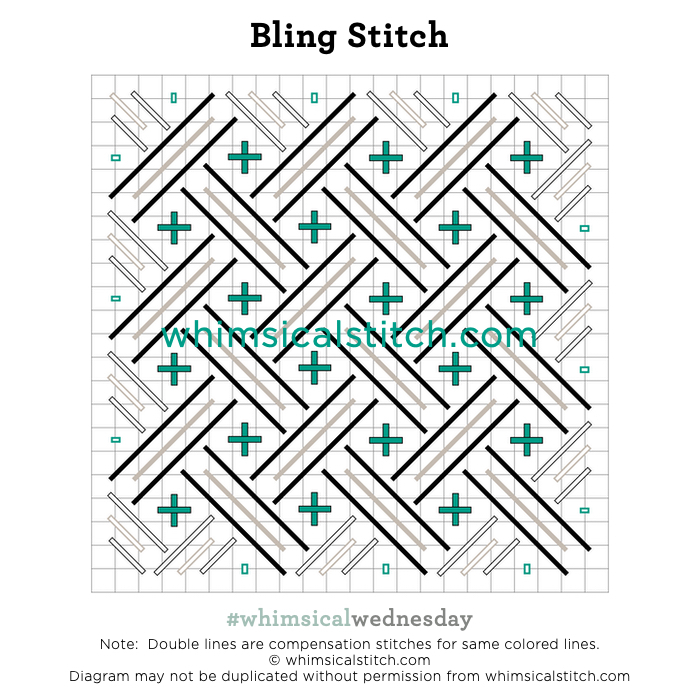 However, today's stitch goes especially quickly because you add two rows on either end for subsequent stitches leading to the center stitch. 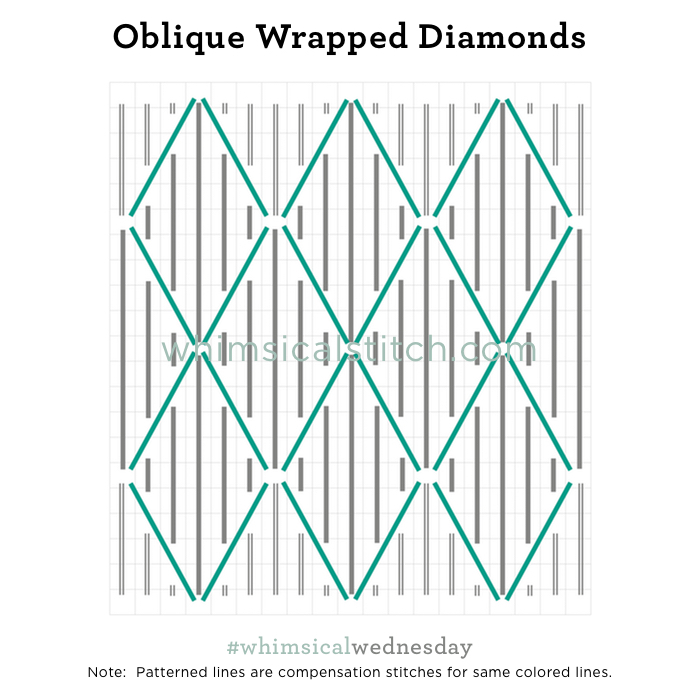 In addition, you skip a row between the diamonds on all but the center stitch. (This helps provide a clear path for the accent stitch.) The stitched sample is me playing at home with Vineyard Silk (gray lines) and Flair (turquoise lines) on 18-mesh. So, a quick and easy full coverage stitch. Win, win! I've used this stitch for clothing (with the thread combo from above). It would be a fantastic architectural stitch, such as a roof, pathway, or wall. However, I recommend distinctly different threads for those ideas. The Flair used in the sample adds a certain softness to the stitch, as is appropriate. For architectural stitches, I recommend a more defined metallic (such as a Kreinik or Treasure Braid) for the accent stitch. If metallic isn't appropriate for the accent thread, use a lightweight perle thread, such as Soie Perlee, Gloriana Princess Perle, Rainbow Gallery's Elegance, DMC Perle Cotton, or Dinky Dyes Silk Perle.